Flowers All Over assures you of the highest quality whether we're delivering around town or around the world. Valentine flowers and gift baskets are a beautiful and thoughtful way to share the holiday spirit with friends and loved ones. Choose from one of our gift items to say "I'm Thinking of You" to your special someone. 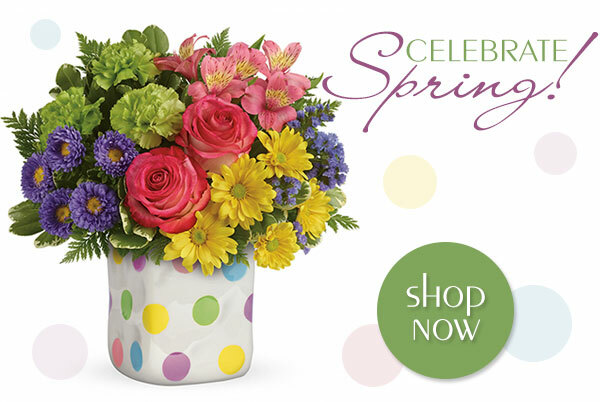 FlowersAllOver.com gives you access to thousands of Teleflora and FTD florist locations worldwide. Our exclusive network of great florists includes only the finest florists possible that stand behind the quality of their work. This guarantees that you get your flower delivery on time and fresh every time you place an order for flowers and gifts. We have thousands of great gift ideas and the freshest flowers imported from around the world available anywhere to make gift giving easy. We know that when you place your order with a florist, you are entrusting us to insure that your sentiments and thoughts are conveyed with the utmost care. That is why we back your purchase with our 100% unconditional satisfaction guarantee which we honestly feel is one of the strongest in the industry.We are committed to offering only the finest flower arrangements and gifts, backed by service that is renowned for being both friendly and professional. As third generation florists, Flowers All Over is truly an expert in the art of expression. Since holidays are the most hectic times in the flower industry, its important not only to place your order early, but to be flexible in your delivery date. We strongly recommend scheduling your order for delivery early in the Holiday week to avoid last minute problems which may result in a missed delivery. This is especially true if you are purchasing any of the nationally advertised specials from FTD or Teleflora. These gift items sell out very quickly and because of their unique nature can not be readily substituted. To avoid disappointment we recommend placing your order as early as possible so your gift choice can be reserved for you. International deliveries can be made to 140 countries outside the United States and Canada. Floral arrangements delivered internationally may vary due slightly from those pictured due to regional and seasonal availability. Currently, specialty gifts are unable to be sent internationally. Prices may be subject to change for certain countries. Please allow for differences in time tones around the world when choosing a delivery date for an International flower or gift delivery.